There is something for everyone at Iberostar Anthelia, which is ideal for families and couples alike, and offers an all inclusive board option. Step into an oasis of luxury and comfort within 60,000 acres of manicured gardens, and take in the stunning panoramic views of the ocean. 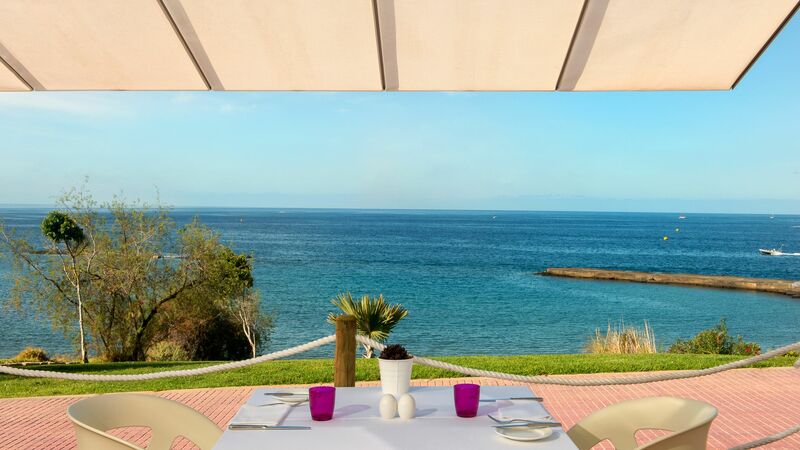 Just 25 metres from the beach, the hotel enjoys an enviable position between two golden beaches. Select from a fine assortment of bright and contemporary rooms and suites with modern amenities, many of which offer a sea view, and all providing an elegant and stylish home from home. 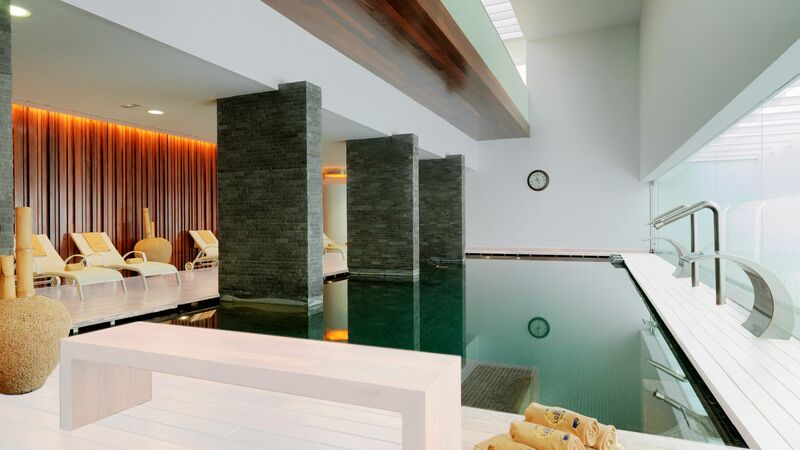 Try the famous Mayr Kur body detoxification treatment to completely relax and rejuvenate at the Spa Sensations while fitness fanatics may prefer to head to the fitness area. 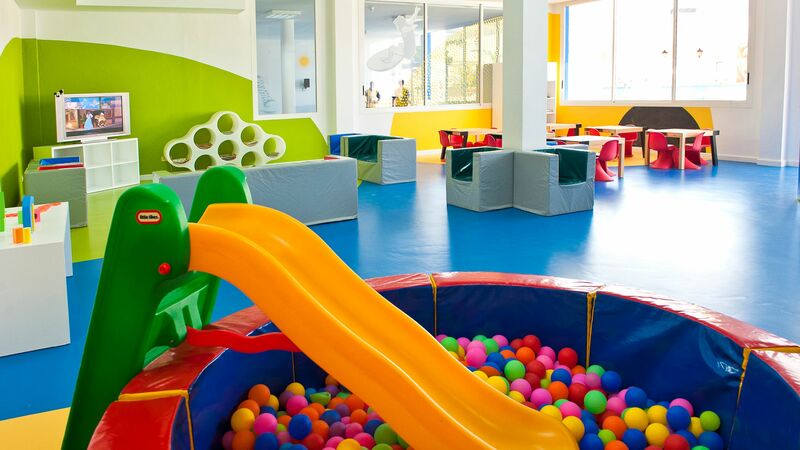 Younger hotel guests will enjoy the Mini and Maxi Clubs, which provide a range of activities while teaching your little ones about the sea and nature. Relax and unwind at one of the three swimming pools before selecting where to eat for dinner. There is a plethora of excellent eateries serving Canarian and Italian specialities, in addition to international favourites. 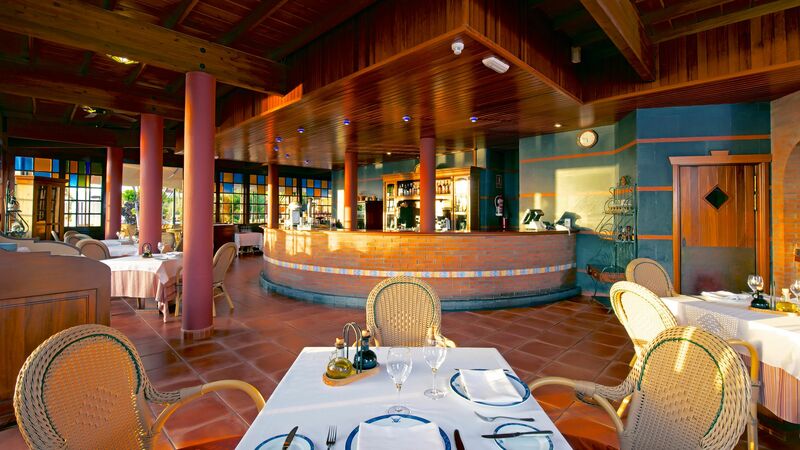 Be sure not to miss Canarian rock fish or sirloin with boletus sauce. A range of hotel child prices apply to ages 2–6 and 7–16 years. The Iberostar Anthelia has 365 rooms. Specially modified rooms for people with reduced mobility are available on request. Buffet breakfast. À la carte lunch. Buffet dinner (guests are entitled to an à la carte dinner in selected restaurants once per stay in each Restaurant, reservations required), drinks at selected bars from 10:00–01:00. Snacks from 10:00–18:00. Free thermal circuits in the SPA Sensations during your whole stay. Enjoy fine à la carte Italian cuisine including fresh bruschettas and focaccias, pastas, and baked pizzas cooked to perfection. 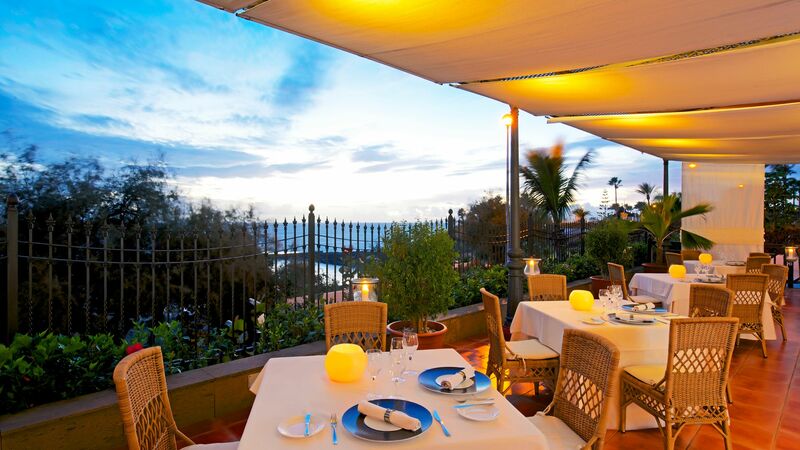 Sit with a glass of Italian wine on the terrace and witness show cooking to perfection. A reservation is required and some dishes may be excluded. Guests on half board and all inclusive may dine here once during their stay. Enjoy this unique gastronomic experience, including live demonstrations. Relish in gourmet à la carte cuisine which exclusively contains ingredients from the local area. Specialities include braised sea bass, cockles, and foie gras which can be enjoyed in this stylish Italian concept dining room overlooking the pool and gardens. Reservation required and some dishes may be excluded. Guests on half board and all inclusive may dine here once during their stay. Gentlemen must wear long trousers and shirt. 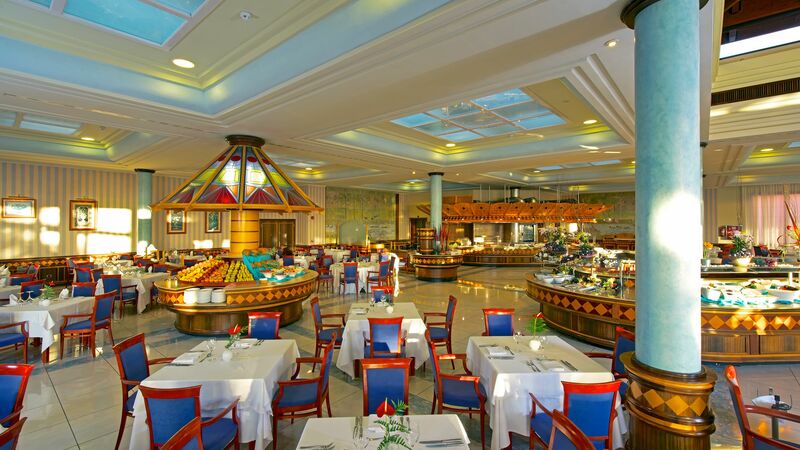 Enjoy fresh produce at breakfast and dinner as you choose from the six international buffets, and a children’s buffet. Select from seafood, cheeses, smoked sausage, and pates, in addition to homemade desserts. There are also themed buffets featuring Mediterranean, Eastern, Canarian, Spanish, and Mexican cuisine. Open: 07:30–10:30, 18:30–21:30 in winter and 19:00–22:00 in summer. Guests on half board and all inclusive may eat at this restaurant. Gentlemen must wear long trousers and shirt. 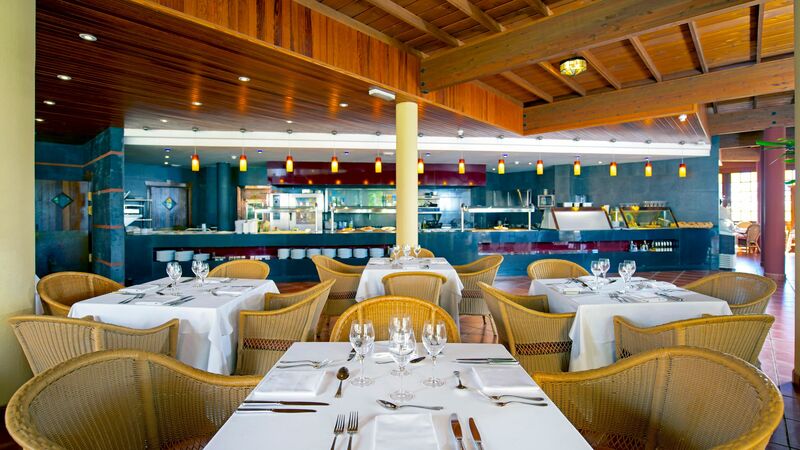 Enjoy à la carte dining from the terrace with an ocean view where you can savour fresh seafood for lunch or dinner. Select from Mussels, oysters, spider crabs, and lobster accompanied by fine wine or a refreshing cocktail as you listen to live music. Gentlemen must wear long trousers and a shirt. Enjoy local and international drinks including speciality strawberry mojitos from the pool bar, accompanied by tasty snacks and light dishes. There’s no need to stray too far from the water at the Barito Pool Bar. Take a break and enjoy a refreshing, cool drink, and some nibbles before heading back to the pool. Enter this stylish Canarian themed restaurant featuring à la carte Canarian lunches including black potatoes with red and green mojo, served in authentic surroundings. Cannot be accessed in swim wear. You will be spoilt for choice with three large swimming pools onsite, including one saltwater and two freshwater heated pools. There is also a children’s pool in the Mini Club. Make new friends and try new activities at the complimentary Maxi Club, where you can enjoy face painting, bingo, table tennis, and billiards. Our youngest guests can enjoy jungle themed colouring and art activities, in addition to a supervised playground, which includes a sandpit, Wendy house, and swings. The Mini Club has two pools, one with a pirate ship and slides. 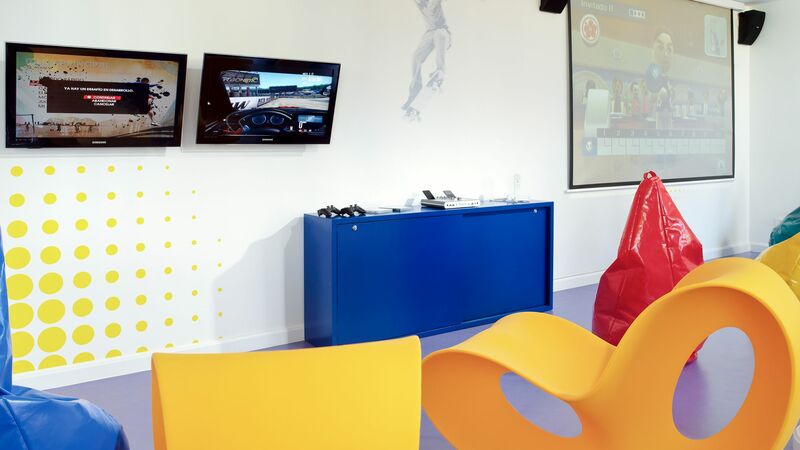 Older children will enjoy their own interactive area with exciting adventures on offer. Experience body treatments, facials and massages using leading product brands to relax and rejuvenate the mind and body. Choose from an extensive range of treatments including Ayurveda hot stones, reflexology, and facial cleansing. Guests who over 16 are welcome to use the Sensations Spa. The perfect place to totally unwind, head to the wellness centre for a thermal circuit, steam room, Finnish sauna, gym, Hammam and sensation showers. Keep your mind and body fit and healthy on holiday at the Iberostar Anthelia, with yoga and meditation classes led by the experts. 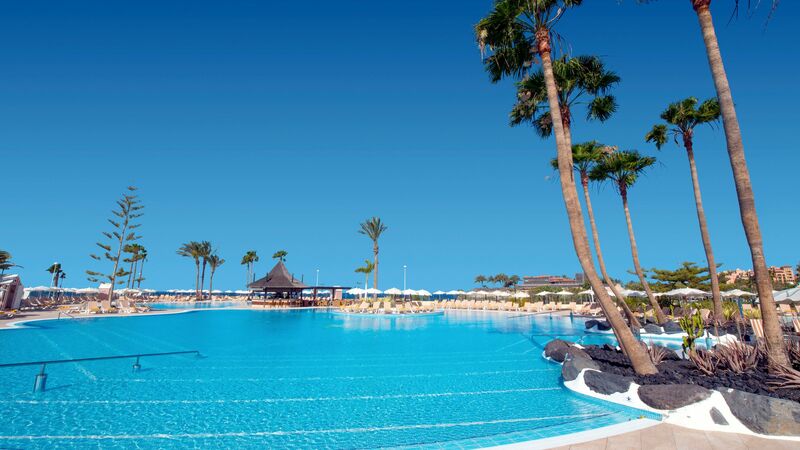 Iberostar Anthelia enjoys a rugged clifftop location, overlooking the Atlantic and Costa Adeje’s golden sandy beach below. Just five minutes away you’ll find the beach, where you can choose your own stretch or enjoy the water sports, beach bars, restaurants and cafés. Families will find plenty to keep little ones entertained, including horse riding and two water parks within a 10 minute drive, as well as restaurants serving child friendly menus. Those wanting to enjoy the upmarket feel of the resort will love the three shopping centres within easy reach of the hotel. Here you’ll find designer shops as well as high street brands. Alternatively, head to Costa Adeje golf course which is a 10 minute drive away and offers beautiful views on a challenging course. 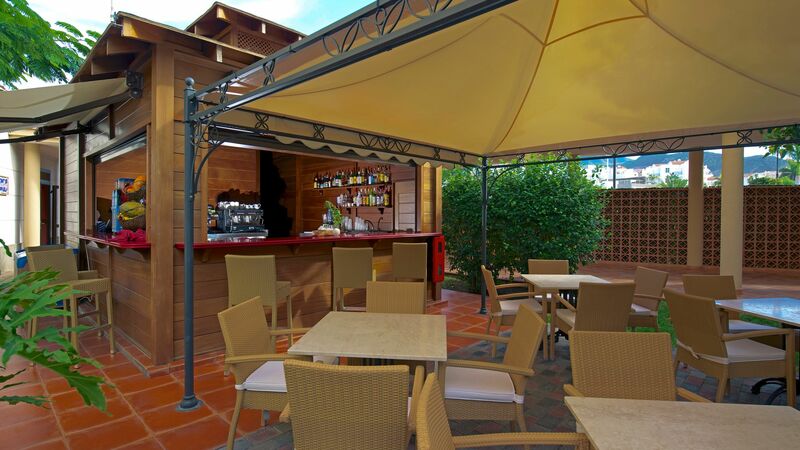 Iberostar Anthelia is a 15 minute drive from Tenerife South Airport. Double Garden View Rooms have twin beds or a double bed, and a camp bed or cot suitable for a child that can be placed in the room if required (maximum occupancy is two adults and one child). The room is decorated in neutral tones with comfortable furnishings and has views of the garden or swimming pool. Double Side Sea View Rooms have twin beds or a double bed, and a camp bed or cot suitable for a child that can be placed in the room if required (maximum occupancy is two adults and one child). The room is decorated in neutral tones with comfortable furnishings and has side views of the Atlantic Ocean. Double Priority Location Rooms are located on the upper floors and have views of the gardens and side sea views of the Atlantic Ocean. The room is decorated in neutral tones with comfortable furnishings. Interconnecting Rooms have twin or double beds, and a camp bed or cot suitable for a child and are decorated in neutral tones with comfortable furnishings. Interconnecting rooms are for a minimum of 2 adults and 2 or 3 children only. Double Sea View Rooms are decorated in neutral tones with comfortable furnishings and the balcony or terrace offers stunning views of the Atlantic Ocean. Interconnecting Superior Rooms are decorated in neutral tones with comfortable furnishings and the balcony or terrace offers views of the sea. Interconnecting rooms are for a minimum of 2 adults and 2 or 3 children only. Double Superior Priority Location Rooms are larger than the Standard Rooms and have a small seating area and a sea view. The bathroom is more spacious and offers a bathtub with an overhead shower. Suites with Sea Views consist of either one or two floors with one or two bathrooms, a bedroom, separate lounge and a balcony that offer views of the Atlantic Ocean. Duplex rooms consist of one bedroom and a lounge located over two floors. Duplex rooms also have a balcony and two bathrooms one of which has a hydromassage bathtub. Combining Far Eastern influences with Western luxury, the Hotel Botanico is beautifully unique, and a proud member of The Leading Hotels of the World. 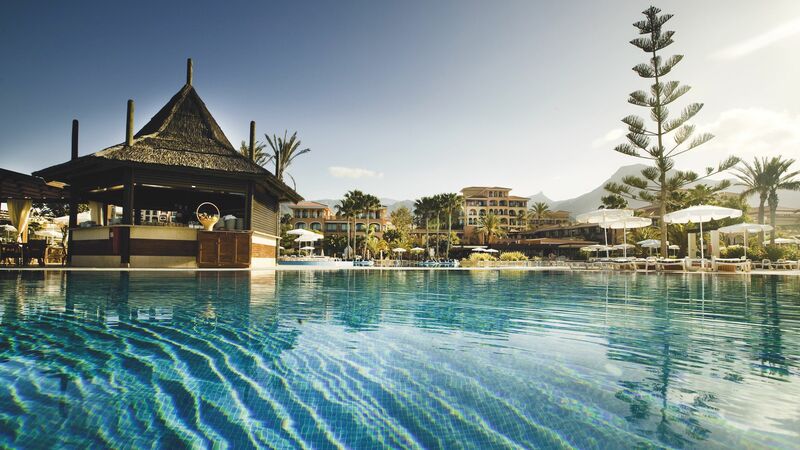 Just one and a half kilometres from the resort centre, Hotel Botanico is an ideal base for exploring the delights of Puerto de la Cruz, but it may prove difficult to leave this tranquil paradise. Save up to 5% on the hotel price for holidays between 01 May - 31 October 2019 booked by 31 March 2019. Save up to 10% on the hotel price for holidays between 01 November - 26 December 2019 & 03 January - 30 April 2020 booked by 07 April 2019. Sovereign guests staying a minimum of 7 nights will receive one complimentary access to the Spa circuit per person per stay, one candlelit dinner per couple at either Poseidon or Portofino (valid for guests dining on half board only and drinks are not included) plus one complimentary bottle of Cava in their room upon arrival for holidays until 31 October 2019. Guests staying a minimum of 21 nights will receive a 10% discount for holidays until 31 October 2019. Guest celebrating their honeymoon or gold/silver anniversary will receive a candlelit dinner for two (drinks not included), a room upgrade (subject to availability), one free entrance to the spa circuit, bottle of sparkling wine and a welcome gift. Valid for holidays until 31 October 2019 staying a minimum of 5 nights. Guests celebrating their honeymoon must not have been married more than 3 months, a copy of their marriage certificate will need to be presented upon arrival. Please note that not all offers are combinable. My family and I had an ok time at Iberostar Anthelia, but the hotel didn?? ?t live it up to its billing as a 5 star. The biggest disappointment was the all inclusive package, which was anything but. It turns out that all inclusive means buffet restaurant and poolside bars, but excludes the two evening a la carte restaurants (Poseidon, Portofino) other than one visit each during your stay. This is not made remotely clear on the website and it?? ?s downright deceitful. Clearly families go away wanting to eat at a variety of places and expect to be able to do so in resort for free, having paid all inclusive. The food itself in the buffet restaurant was similar most nights and not all that special. The resort itself was noisy at night until about 11pm, which is not great for families, and the walls between apartments were thin so noise in the rooms next door caused disturbance. The standard of English amongst the restaurant staff was very mixed. My Spanish should be better, of course, but ultimately I?? ?d expect all staff in a 5 star resort to be fluent in English, given the number of English guests. The cleaning was adequate but a little bit on the least-we-could-get-away-with side. The reception were bad at answering phone calls and problems with the TV remained throughout the holiday. All that said, the staff were very pleasant and helpful, the swimming pools were nice, and the hotel was a short, convenient journey from the airport. Our family of 6 stayed for a week over Easter. We loved our welcome drink at check in and our room was very welcoming with a chocolate left each evening. The hotel is so clean and the staff are so helpful and friendly , special mention to manager Diego who made sure our stay was enjoyable. With the Masters Golf and Champions league quarter finals on it would?? ?ve been great to have a Tv to show the sport. Also the evening entertainment could?? ?ve been better with many performances by hotel staff , maybe some tribute bands would?? ?ve been good. The food and location was fabulous and hopefully we can return soon. Pro: Very central location. Not far from airport in the south. Large lobby. Spotless. Lovely entertainment. Decent variety of non veg food and fish. Great deserts. Staff do tell guests off for reserving sun beds politely - very good of them as people should be considerate to each other. Very helpful in organising a trip to Lora Parque (a must see for kids). Kids club is good. Nice pool and slides and good entertainment for them. Nice entertainment team. Cons: First room Was in the A wing next to lobby - very very very very noisy with disco music - totally unsuitable for young children or if to sleep before 11pm. Room changed next day on request but few hours wasted in repacking and moving. Hotel was full over Easter. The staff were all rushed off their feet. Very polite but obviously very stretched. They need more staff especially in the bars restaurants during busy times. Would I return - yes I would overall we had a nice time here. Top tip. Go all inclusive it?? ?s worth it with a bottle of wine at 35??? and a nice at 6???. I stayed for a week with my 8 and 5 year old and we have had an amazing time. Rooms are great with excellent views and great facilities and food. Must give credit to the entire ream who made the holiday memorable - looking forward to going again soon. Location is perfect and super clean and well maintained property. Team at Zeus make dinners and breakfast feast to enjoy and plenty of choice especially sweet treats for the kids. great rainfall showers - they actually work unlike many hotels who boast having them but do not actually function. simple perfect!! thank you team for a wonderful time!! I never thought a family holiday could be so relaxing - the grounds are beautiful, the pools are fantastic for kids and for teenagers to lounge by and drink smoothies. The spa also allows kids in a couple of sessions a week, which our teens loved. We were all inclusive and all the food was fantastic (I don't understand reviews here that complained about it - what were they eating??) - evening buffets varied and there was always an amazing selection of desserts. We loved sushi night the most. The other restaurants (book on arrival, they fill up) were also worth a go - good food and lovely outdoor terraces for evening meals. The breakfasts are huge! We worried briefly that our door wasn't locking properly, and the staff did everything they could to help and reassure us. We were worrying unnecessarily, but staff still took our concern really seriously. We had a joining double family room and there was plenty of space, even for a family of 5, which is rare. As a final thoughtful touch, it was my husband's birthday while we were there and we came back that evening to find a cake and birthday candle in our room. I can't fault this hotel.